Here’s a FUN project I’m doing this weekend, Saturday November 6th, from 10am to 2pm at the Toronto Reference Library at Yonge and Bloor. Please spread the word and consider “taking me out”. I’d love to chat with you about your Green Conscience. 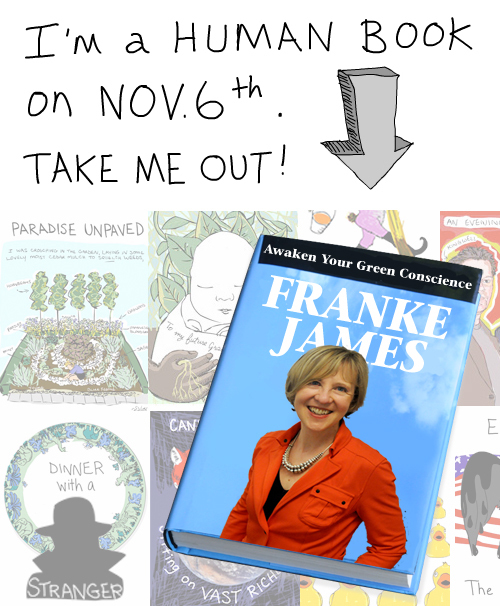 Franke James will appear as a Human Book at the Toronto Reference Library on Nov.6, 2010. Are you ready to awaken your Green Conscience? Do you have a Green Conscience? Do you want to do more than just change a few light bulbs? Find your path to green by “taking out” artist Franke James. In 2007, Franke “did the hardest thing first” by selling her only car (an SUV) and then won permission from City Hall for the right to build a green driveway. She is the author of the award-winning graphic novel, Bothered By My Green Conscience, and the visual essay, Dinner with a Stranger. This book will entertain – and may just inspire you to “do the hardest thing first” for the planet. How do you check out a Human Book? Franke James is an artist and storyteller who merges science and personal activism to inspire people to do the hardest thing first for the planet. Franke creates visual essays on environmental and social issues. In late November, Franke’s visual essay Dinner with a Stranger will be featured on CBC Radio’s DNTO (Definitely Not The Opera). Her latest essay, What Can One Person Do, When 6.8 Billion Are Frying The Planet? has just been published on Grist.org, 350.org, and Change.org. Toronto Public Library’s first Human Library is an opportunity for Torontonians to walk in someone else’s shoes for a few minutes and see beyond labels and begin to celebrate differences. Each human book is an individual who has been selected because of their unique life experiences. Through positive, personal dialogue, the program is focused on encouraging new ideas and ways of thinking, to celebrate differences and promote tolerance. “Living Libraries” were first launched in Copenhagen in the early 1990s to combat prejudice and raise awareness through one-on-one dialogue. Countries all over the world now hold human libraries and some public libraries even have permanent collections. This one-day pilot event on Saturday, November 6 – 10:00 a.m. to 2:00 p.m. will take place simultaneously at five branches across the city. Library cardholders will be able to begin placing holds on their chosen human books beginning October 23. To learn more about the Human Library and how to participate in the program, please call 416-393-7131. @_filesoof_ Franke James » “This Saturday, I’m a Human Book!” http://t.co/o8ZowmO @frankejames – I’d fly in, but that’s not very #green !